I pictured Freimuth with a mad hat, as Willy Wonka, giving a tour of his version of the Chocolate Factory—the Brooklyn-based design studio Franklyn he co-founded with collaborator and life partner Patrick Richardson. This is his lab, where he and his colleagues, “take it the limit” with client projects. Design is a process of iteration and the creative folks at Franklyn iterate a lot. Asking themselves: How can the work be more interesting, a la more weird, while still maintaining a solid design grounding, a la convention? Freimuth shared the story behind his team’s identity design work for the Nike Tennis brand. A refreshing demonstration of stirring the graphic design brew and playing with visual matter: colors and shapes, lines and letterforms. Gauging the threshold of designerly exploration and client reception. Though this project transpired without realization, no reason given by Freimuth except that they had “gone too far” with their iterating, I appreciated Franklyn’s daring work in this case, albeit having the appearance of vector-graphic sludge. Striking harmony between the conventional and the fantastical is, of course, highly subjective. When Freimuth displayed his slide, showing a montage composed of sample art and collectibles portraying his client Sotheby’s, he described the world’s largest broker of culture as “a little bit stodgy.” The montage was visibly eclectic, from Cubist art by Picasso to dazzling labrador-retriever-inspired jewelry. Bowie was also a part of this Sotheby’s-centric montage. “A little bit stodgy”? WTF? There was an undercurrent of making weird design for weird’s sake throughout Freimuth’s talk. A precedence-is-automatically-judged-as-dull vibe. What’s conventional and what’s not is open to interpretation. But it can lead to a dismissive attitude. When it comes to creativity and design, work from the past shouldn’t be passed as passé. In keeping to strike that balance where conventions and weirdness are married blissfully, Freimuth provided a combined best practice: Keep being mindful of the tried and true ← Keep it weird. 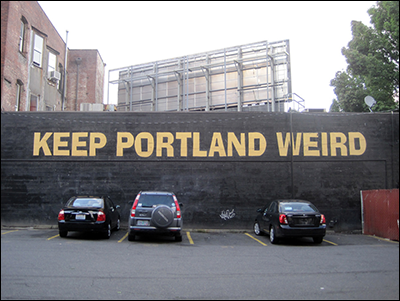 Portland, Oregon—“PDX”—proudly shares the “Keep It Weird” decree. View my travel photos. 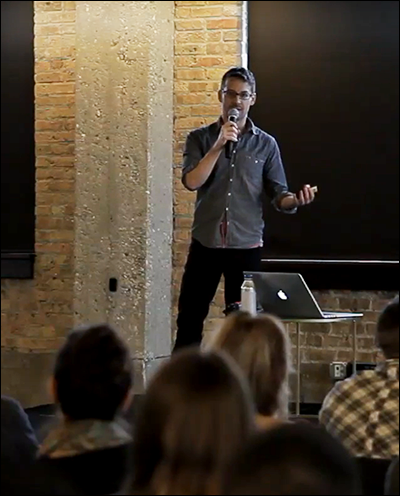 Big thanks: to Braintree (who also hosted), Savage Smyth, Green Sheep, Lyft Chicago, for being Partners of Chicago CreativeMornings #59; to new organizer Jen Marquez who took over the chapter’s management from Kim Knoll and Kyle Eertmoed who both spoke at Chicago CreativeMornings #7; to the team of volunteers for greatly helping to have CreativeMornings happen monthly in Chicago.